A color difference equation is a mathematical model that aims to closely correlate the visual difference (DV) to the computed color difference (DE), obtained under specific conditions (sample size and arrangement, background, lightness sources etc.). The ultimate goal is to generate a single-number shade pass/fail value for evaluation of objects. 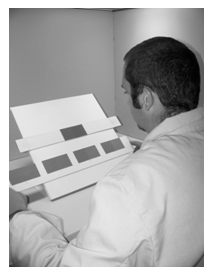 In the case of suprathreshold (small to medium) color differences, which are typically used in the surface color industries, an accurate representation of the average visual difference of two stimuli and prediction of the magnitude of such differences is especially important for quality control purposes. To date, a large number of advanced color difference equations have been proposed based on different visual discrimination datasets. These formulae can be divided into two broad groups: those based on the CIE L*a*b* space including DE*ab, CMC (l:c), BFD (l:c), CIE94 and CIEDE2000, and others including DIN99d, CAM02-SCD, CAM02-LCD, CAM02-UCS, as well as OSA-GP and OSA-Eu. 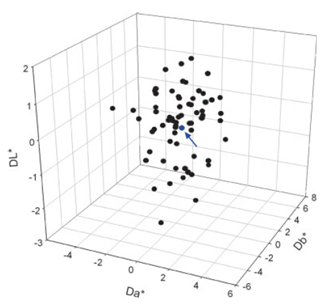 These models were optimized against specific datasets that were established under various experimental conditions, using a diverse range of assessors and substrates. However, their performance in certain regions of the color space, especially for the blue, near neutral and black colors is less than desired. Our aim is to supplement perceptual datasets in key regions of the color space including the low, and high chroma blue region as well as near neutral colors, and optimize the performance of existing color difference models using the new datasets. We have generated four datasets in specific regions of the CIELAB space with at present a small amount of visual data sets around the low and high chroma CIE blue color center and also near neutral color regions denoted respectively NCSU-B1, NCSU-B2, NCSU-BK and NCSU-2. These datasests are described below. This dataset contains 69 dyed polyester knitted sample pairs with an average DE*ab of 3.37, with a range of 0.56-7.57. The distribution of samples in NCSU-2 dataset is shown in Fig. 1. A total of 100 observers (37M, 63F) from four different regions of the world, i.e. South America, Europe, North America and China participated in the visual assessments. 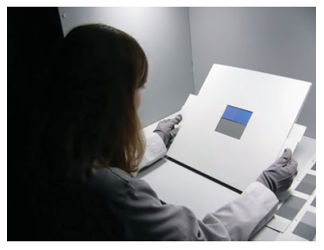 The perceptual assessments were conducted under well controlled viewing and illumination conditions using a SpectraLight III (X-Rite) viewing booth with calibrated filtered incandescent daylight simulator. A novel perceptually linear gray scale was developed and used for visual assessments. The viewing/illumination geometry, and the gray scale used is shown in Fig. 2. The NCSU-B1 dataset contains 67 blue dyed polyester knitted samples including one with attributes corresponding to a CIE recommended blue color center (L*: 36, a*: 5, b*: 31). The distribution of samples is shown in Fig. 3. Visual assessments were conducted using 26 observers (16 male, and 10 female) under well controlled viewing and illumination conditions.Observers ranged between 21 and 36 years of age. The evaluation of differences was carried out using a modified AATCC gray scale where identical gray sheets (supplied by X-Rite) were used to construct 2 × 2 inch gray squares in a pattern identical to that of the standard AATCC gray scale for color change, as shown in Fig. 4. A standard with attributes corresponding to a CIE recommended high chroma blue center (L*:34, a*:7, b*:-44) and 65 samples were used in the NCSU-B2 dataset, using dyed knitted polyester substrates as shown in Fig. 5. The overall contribution of lightness, chroma, hue, and their combinations to DE*ab against the standard was considered. The average DE*ab of the 65 samples was 2.59, with a range of 0.23-4.59. A total of 26 observers (13 M and 13 F) with an age range from 20 to 42 years and an average age of 23 were employed in visual assessments. 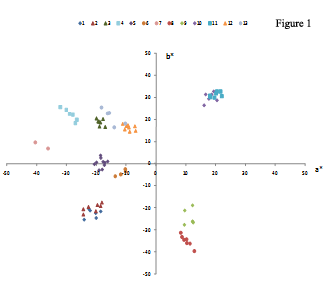 The AATCC Gray Scale for Color Change was used for the perceptual comparisons, as Fig.6 shows. The dataset generated around the near neutral black region of the CIELAB space is described here. We are currently attempting to optimize existing models, e.g. CIEDE2000, and OSA-GP with an aim to improve their performance in the neutral and blue regions and are also examining novel color difference models.